For many years, the Ruth Conklin Gallery has been the North’s premiere outlet for fine art from local artisans as well as acclaimed national collections. 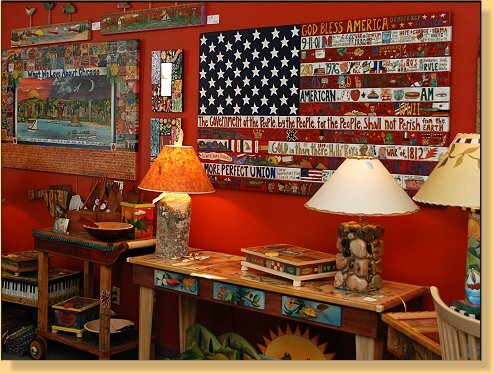 The gallery's three spacious rooms overflow with the beauty, creativity and inspiration of more than a hundred Amercian artists and craftmen. A major resource for Sticks furniture and accessories, the Ruth Conklin gallery is proudly one of the top ten retailers of the Sticks product line in the country. 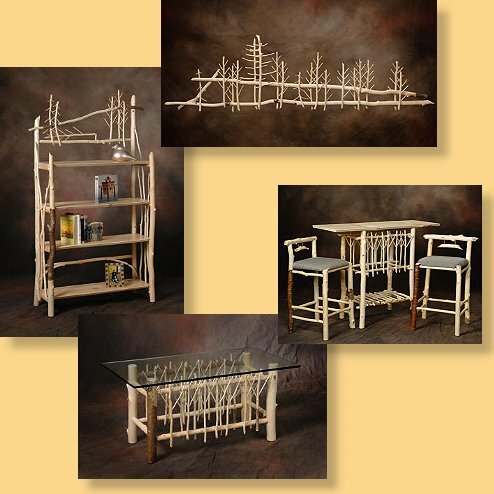 Ruth Conklin Gallery offers the Midwest’s largest selection of Sticks design furniture and art objects, and now you can buy Sticks pieces from our online store at www.SticksUpNorth.com anytime! Sarah Grant, founder of Sticks, calls the Glen Arbor area her “favorite place on earth.” It was her summer visits to Glen Lake and the Sleeping Bear Dunes that originally inspired the nationally celebrated folk art furniture and accessories collection. Game tables, perpetual calendars, activity boards, grandfather clocks, armoires, jewelry chests, entertainment cabinets, beds, desks, trunks, tea carts, vanity dressing table, dining tables and chairs, and library chairs with versatile ottomans in painted leather. Lazy Susans, wood plaques, floor and table lamps, small tables, mirrors, photo frames, treasure and recipe boxes, benches, coat racks and clocks. Angels, Hallelujah figures, Sculptures, Statue of Liberty, Father Christmas, Santa, snow "persons" and other whimsical objects of art that resonate with the Sticks creative approach to cherished treasures. Michigan and American flags, historically correct additions for home or office. Up North Designs, Chicago, and St. Louis all include a variety of pieces. Master woodworker Leonard Fieber’s Beaver Chew furniture is a unique and natural way to enhance your home or office space and provide a distinctive connection to nature. These pieces are made from the wood the beaver leaves behind after chewing the bark and leaves off. Beavers favor a variety of woods, including aspen, poplar, beech, birch, white pine and maple. The sticks are collected from the lakes and rivers in the Upper Peninsula of Michigan. The beaver is a major collaborator and source of material, as it is he that determines the shape and texture of each stick. The table tops are circular cut white pine from a local sawmill and all of the furniture is finished with a modified waterborne urethane and can be cleaned the same as any fine furniture. The wood is the natural color and has no stain applied. Al Rollings creates carved images of birds, fish and other Michigan wildlife from beach driftwood he finds in the Leelanau Peninsula. His professional training as a veterinarian assures anatomical accuracy. His skills as a craftsman produce wonderful carvings sensitive to the interpretations of the creations of nature. The Ruth Conklin Gallery carries an enormous selection of beautiful handmade jewelry made with semi-precious and natural stones, beach glass and a variety of metals. Many of the pieces available feature the illusive Petoskey stone, native to the northern portion of Michigan's lower peninsula and highly prized for it's unique honeycomb fossilized coral pattern. Ruth Conklin Gallery offers an abundance of artistic gifts and services for perfect weddings. Wish lists and wedding/shower services are free. Shipping also is available at the gallery. Ruth and her friendly staff are knowledgeable about the Glen Arbor area, and they are happy to answer your questions. 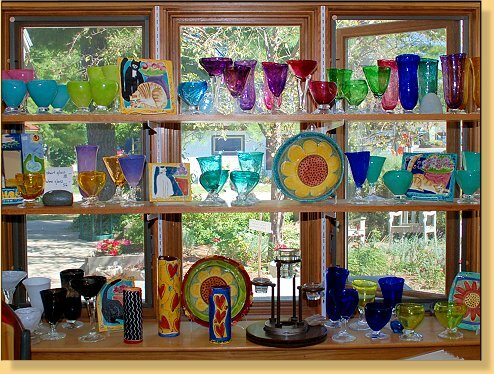 Prentice Hicks creates hand-blown glassware in a rainbow of colors and useful sizes. Beautifully decorated ceramics by Louise Hopson can brighten a new living space. Turtle Island hand woven rugs complement every color scheme. 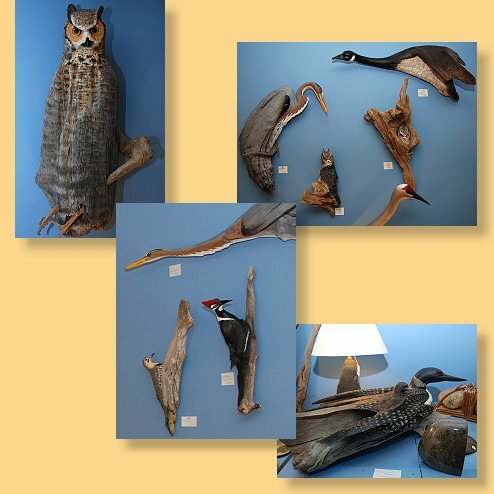 Al Rollings' driftwood carvings of birds are a thoughtful gift for the bridegroom who treasures the outdoors. Ruth Conklin's paintings of sleeping bear dunes landscapes are popular gift choices, as are her delightful sleeping bear legend wood stools, frames and mirrors. 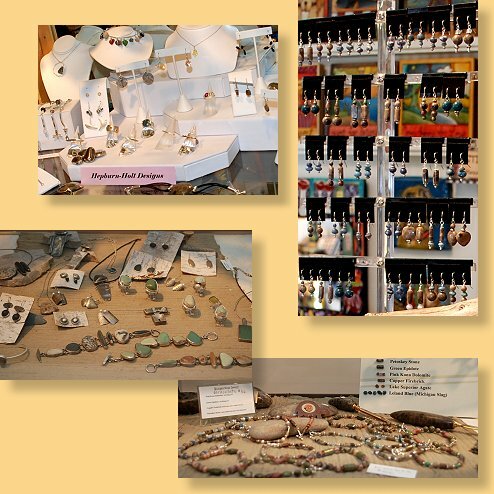 The entire gallery is overflowing with tasteful art and accessories, including lovely handmade jewelry and Petoskey stone artifacts perfect for gifts. Come visit us and see!